Put your almonds and icing sugar in a food processor and whizz them together to make sure they are totally mixed and to break down the ground almonds a bit more. Don’t over do this or you will release too much oil from the almonds and make nut butter. A few quick pulses will do the trick. Whisk the egg whites for a minute or so and then add the caster sugar bit by bit with the whisk still on until it forms stiff, glossy peaks (still meringue will make much better macarons so stick with it!) . Pipe out circles straight lines across a baking sheet lined with baking paper. Leave a 1 cm gap between each macaroon shell. I do this by holding the piping bag vertically to baking tray and piping for the count of three and releasing “one-two-three-release!” counting for longer will give you bigger macarons! Rest at room temperature for about 30-60 mins until a skin has formed and the shells are no longer sticky. You can pre-heat the oven at this point. If you don’t have one already, get an oven thermometer. 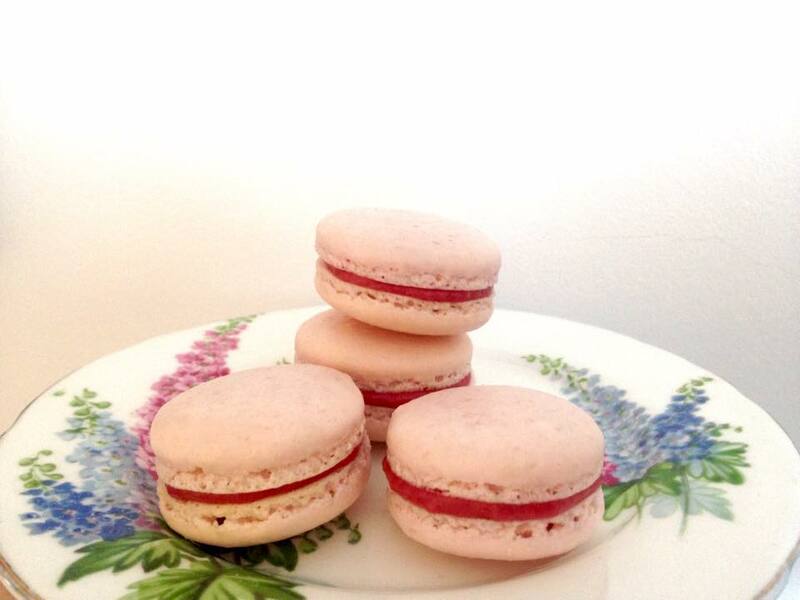 Ovens are rarely the temperature the dial claims it is and for macarons you need accuracy. Bake in the oven for about 15 minutes at about 150c – keep the oven door slightly open with a spoon to prevent steam building up in the oven. Every 5 minutes rotate the tray. After 15 minutes, check the macaroons are cooked by gently lifting a macaroon at the edge of a tray. 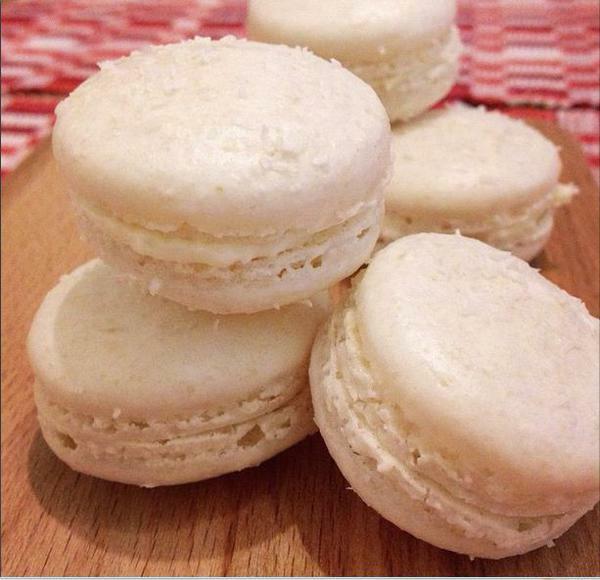 If the test macaroon does not stick, allow the tray of macaroons to finish cooking on the tray as it cools. Make sure the macarons are cool before filling. Italian meringue buttercream flavoured in different ways is great as a light filling or use the left over egg yolks to make creme patisserie and flavour it up! Lazier fillings include nutella, jam er…lemon curd, whatever really. 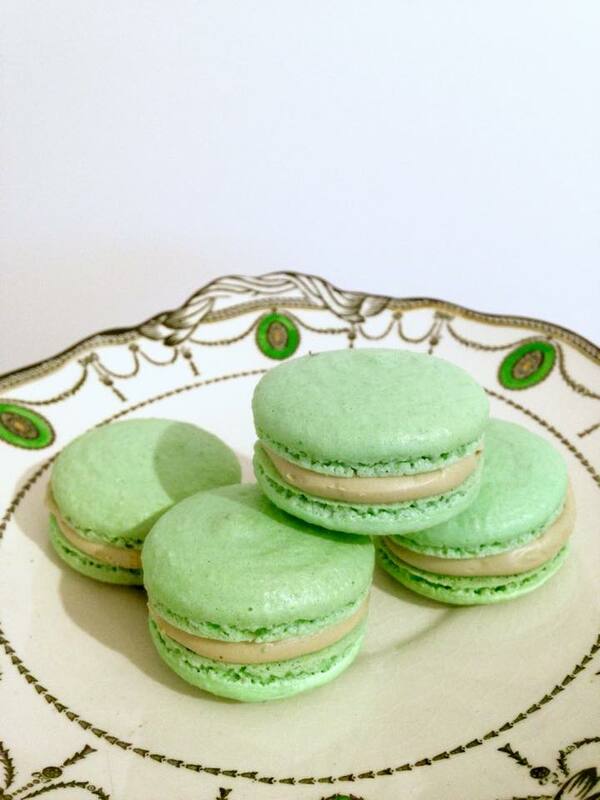 Pistachio paste in base Italian Meringue Buttercream! Coconut sprinkled on the shells after piping filled with white chocolate ganache made with a mix of double and coconut cream. The main thing to note about macaron making is that although you need to be precise and it takes practice – it is not magic. Follow the steps, enjoy even the less than perfect results (they will still taste good). under mix rather than over mix. Have fun. It is just a biscuit. Thanks – the tip about the spoon in the oven is interesting and I’ll try it. My recipe and instructions (got from a one-day course at the brilliant Women’s Institute Cookery School) are much the same as yours, but the care during the baking is a new one to me. I started using silicon mats recently with raised circles on them and found they helped enormously in shape, height and in removing them intact. On colourings, because we don’t like violently bright additives, I use a little turmeric for orange. Cocoa powder is the big favourite, though.